"Delicate" music video starts with Taylor Swift entering a huge red carpet event with the press hounding on her,as she climbs the stairs, a stranger slips a visiting card (which glows) into Taylor's hands and swiftly walks away. As soon as she enters the reception hall, other celebrities take a selfie with her, while a janitor tries to jump on her back, like literally. As her bodyguards pound on the janitor, Taylor takes a stroll through the hotel's ball room and check herself on the mirror. She does several funny faces on the mirror, including pulling her cheeks and lips, while her elbow accidentally touches the glowing 'visiting card'. Feeling strange, Taylor once again checks herself in the mirror, but could not see her reflection anymore. As she comes to the reception hall, nobody seems to recognize her, including her own bodyguards. She yells at her bodyguards who are completely unaware of her presence. Finally realizing that she is invisible,Taylor rips her dress off and starts dancing like a teenager, she even climbs on to the reception desk, dancing like a ballerina. She slips outside the event, dancing on the streets, in the pouring rain...enters a metro train, reaches the spot mentioned in the 'visiting card' and starts playing video games, in her dripping wet attire. Everyone starts staring at her, that's when she realizes that she has become visible again. 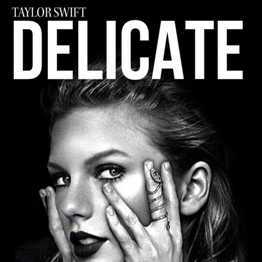 Released on the 12th of March 2018, from her sixth album Reputation, "Delicate" has more than 314 million views on YouTube, with 3 million likes. Many YouTubers have commented, that this song (and music video) is a reminiscence of the old Taylor Swift, while others have commended Taylor for being herself in the music video. Some have added, that the media only notices her when she locks horns with some other celebrity. Neither "Delicate" nor Reputation received any Grammy nomination, which was a huge disappointment for the Swifties.